Songs can come from anywhere. The distinguished English lawyer Fred Weatherly wrote an estimated 3,000 lyrics during a colourful life. An acquaintance of Charles Dickens and William Gladstone, Weatherly had been invited to sing his songs to Queen Victoria at her jubilee in 1897, and, to illustrate a book of his words, had called upon the talents of an unknown illustrator named Beatrix Potter. But his most famous work came about quite by chance. His brother, Edward, had moved to the United States in 1899, and it was there, during the Gold Rush, that his wife, Margaret, heard a prospector playing a delightful melody that had left Ireland with the tide of emigrants fleeing the Great Famine in the 1840s. The tune was known as ‘The Londonderry Air’, and Margaret thought immediately of her brother-in-law back in England. Fred matched the melody she sent him to a set of lyrics that had sat festering in his desk drawer and, as luck would have it, the words matched the tune almost exactly. Published in 1913, the resultant song, which he called ‘Danny Boy’, would become one of the most popular songs of the last 100 years, recorded by everyone from Judy Garland and Bing Crosby to Johnny Cash and Elvis Presley. Sir Hubert Parry, professor of music at the University Of Oxford, called the song “one of the most perfect in existence”, yet it seemingly arrived purely by chance. But clearly, some songwriters have a greater ability to pluck them from the ether than others, so what sets the great songwriters apart? People have been writing songs for as long as human history has been recorded, and the best have been making a living from doing so for as long as we know. Even Mozart worked as the equivalent of what we might think of as a songwriter, crafting works on command as the chamber composer for the Holy Roman Emperor, Joseph II. At the dawn of the 20th Century, there were countless songwriters, often people like Fred Weatherly, who enjoyed dabbling with words and music, some of whom struck it lucky. And the more canny craftsmen and women had figured out how to turn their dalliance into a business. With changes in copyright law in the United States during the latter half of the 19th Century, songwriters and music publishers began working together more closely, for mutual benefit, and, by the end of the century, the majority of the big publishers had congregated on West 28th Street near Fifth Avenue. The area became known as Tin Pan Alley, supposedly thanks to the percussive sound of so many cheap pianos sounding like tin pans banging in an alleyway. The way the business worked was that an aspiring songwriter would do the rounds of the publishers, banging on their doors demanding to have their songs heard. If a publisher liked a song, he might buy the rights to it outright, or negotiate a percentage deal with the songwriter. It wasn’t uncommon practice for the publisher to add their name to the songwriting credit in order to maximize his share of the royalties. Many of these songwriters were immigrants from Eastern Europe. One such was surely Tin Pan Alley’s most famous – and successful – songwriter. Born Israel Leilin in the Russian city of Talachyn (in modern-day Belarus) in 1888, his family fled the anti-Semitic pogroms, arriving in New York City when Israel was five years old. Having busked in the streets and bars to help support the family, an Americanisation of his name saw him reborn as Irving Berlin by age 18, at which point he published the first of over 1,000 songs he would write in his 101 years. 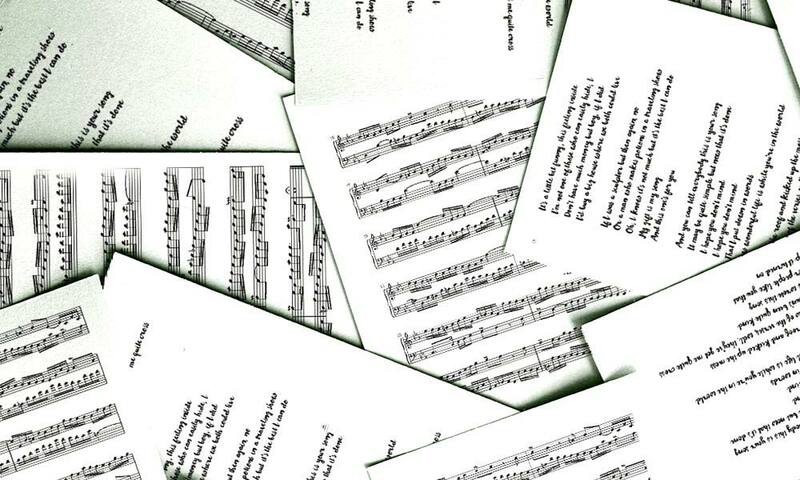 Once a song had been written, and picked up by a publisher, the publisher would then employ pluggers, singers and piano players who would play the song in shops selling sheet music, or at theatres, in order to drum up interest in it. After all, it was sheet-music sales, not recordings, that generated the revenue at the turn of the century. Many of these pluggers would also be songwriters – including George Gershwin, whose most celebrated work is ‘Rhapsody In Blue’, an intoxicating fusion of classical and jazz. Other Tin Pan Alley songwriters included Cole Porter, duo Richard Rogers and Oscar Hammerstein, Scott Joplin and Hoagy Carmichael. As well as providing songs to be sold as sheet music, many of the Tin Pan Alley writers would write for the hit musicals on nearby Broadway. But as recorded music began to become more and more popular, with customers preferring to buy a record player, rather than accompany themselves on the piano, the industry in New York shifted from Tin Pan Alley up to an office block at Broadway and 49th Street. Known as the Brill Building, the 11-storey structure was completed during the Great Depression. The timing couldn’t have been worse; business was slow, and, despite its sumptuous décor, its offices were soon filled by music publishers and songwriters, paying bottom-dollar rent. As the big-band era gave way to the birth of the pop single, Billboard’s Hot 100 was packed with Brill Building songwriting teams like Burt Bacharach and Hal David, Gerry Goffin and Carol King, Mike Leiber and Jerry Stoller, Ellie Greenwich and Jeff Barry, and Doc Pomus and Mort Shuman, as well as floating individuals such as Paul Simon, Phil Spector, Neil Diamond and Neil Sedaka. These and other writers would dominate the American music charts for years, writing hits for Elvis Presley, The Ronettes, Bobby Darin, The Drifters, Dionne Warwick and Gene Pitney. Of course, not all songs were written in hotel suites, office buildings or recording studios. Many of the most enduring songs were written by desperately poor people – especially in America’s Deep South. Blues musicians would often write their own material, as would gospel singers. One example of an enduring songwriter from this sphere is Lead Belly, who took inspiration for an early song from the sinking of the Titanic. Despite spending more than one spell in prison, Lead Belly is remembered not as a killer, but for songs like the enduring ‘Goodnight Irene’, ‘Cotton Fields’, ‘Rock Island Line’ and ‘Mystery Train’ – a song that helped launch the career of another poor southerner, Elvis Presley. Today, we have folklorists John and Alan Lomax to thank for recording many such songs, which would otherwise have disappeared over time. The father-and-son team documented countless great songsmiths, from Jelly Roll Morton to Pete Seeger and Woody Guthrie, all of whom would make an indelible impression on a generation of young musicians born during or soon after World War II. On that first, eponymous record, Dylan wrote a song in honour of his songwriting hero, Woody Guthrie, whose ‘This Land Is Our Land’ is something of an alternative national anthem in the States. In ‘Song To Woody’, Dylan gives a nod to other great songwriters, including Lead Belly and bluesman Sonny Terry. But as well as this tradition of folk musicians, Dylan was also influenced by the proto-rock’n’roll music that came out of the Brill Building. Raised on rock’n’roll as well as blues and folk, Dylan, under the name Elston Gunn, performed as part of Bobby Vee’s band, playing many of the hits the Brill Building stable had penned for the singer. It was this coming together of the different means by which American popular music was created that fuelled a revolution in the 60s – on both sides of the Atlantic. Of course, Britain, like all countries, had always had its fair share of songwriters. But, by and large, none of them made any impression outside of their own territory, until the emergence of The Beatles in late 1962. The idea of a band who wrote their own songs wasn’t entirely unheard of, but to have two songwriters of the calibre of John Lennon and Paul McCartney (later supplemented by the emerging talent of George Harrison) was nothing short of revolutionary. The pair had been writing songs, both together and apart, since their teens – indeed, it was their joint love of songwriting that first bonded them. And while their earliest records included covers of songs born in the Brill Building, as well as other US hit-making factories, such as Detroit’s Tamla Motown stable, it was their own compositions that sent shockwaves around the world. Soon, everyone wanted a song written by the Beatles or Bob Dylan. 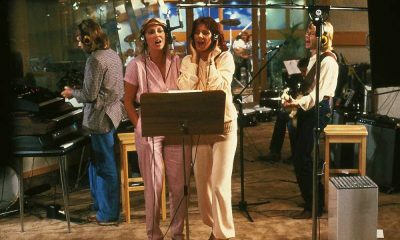 The latter gave hits to a host of stars from Nina Simone, Johnny Cash and Frank Sinatra to The Byrds, Animals and Manfred Mann, while Lennon/McCartney compositions were covered by performers from Ella Fitzgerald to Peter Sellers, as well as helping launch the careers of Billy J Kramer And The Dakotas, Cilla Black and The Rolling Stones. It wasn’t long before the notion of not writing your own songs came to divide the pack. While earlier stars such as Sinatra and Elvis continued to select the cream of the crop from the world’s best songwriters, the critics were becoming more critical of anyone who didn’t pen their own numbers. Andrew Loog Oldham, the Stones’ dynamic young manager, pointed out to his charges that they were missing out on huge revenue streams by not writing their own material. After much badgering, without success, he decided the only way to get Mick Jagger and Keith Richards to come up with the goods was to force them into it. As Oldham wrote in his memoir: “One evening I told Mick and Keith I was going to my mother’s to eat – I was locking them in the flat and when I came back I expected a song, and they’d better have one if they expected me to bring them any food.” Keith Richards later remembered the occasion as: “A mind-bending experience for me. I was a guitar player. A songwriter, as far as I was concerned, was as far removed from me as a blacksmith or an engineer.” The results were ‘As Tears Go By’. In retrospect, it can appear today as though, as the 60s progressed, pop music had diverged into two very different strands. On the one hand, the “credible” artists, such as The Beatles, Stones, Dylan, The Beach Boys, The Who, Jimi Hendrix, Simon And Garfunkel, et al – were artists in the true sense, crafting the songs they would use to make their groundbreaking records. On the other hand, you had more traditional pop stars who would have hits with songs selected from a publisher’s catalogue of – artists such as Ike & Tina Turner, Dusty Springfield, Cliff Richard and Sonny & Cher. The reality, of course, is rarely as simple, and there were plenty of acts who mixed and matched with original compositions and covers, among them Otis Redding, Aretha Franklin and the Motown hit machine. And so it would continue into the next decade and beyond. Great songwriters the likes of Elton John, David Bowie, Bob Marley, Merle Haggard, Joni Mitchell and Bruce Springsteen would have huge original global hits, while countless other pop stars would look for material to record. 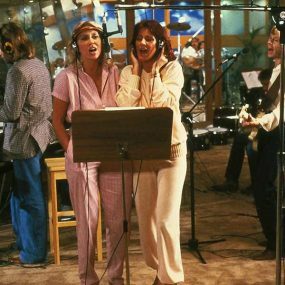 And while singer-songwriters seemingly reigned supreme during the 70s, one of the decade’s most successful hit-making acts was the team of Benny Andersson and Bjorn Ulvaeus, who, with ABBA, scored eight consecutive No.1 hits in the UK. Solo or as part of a team, if asked to name the greatest songwriters of the last 50 years, most people would come out with a list of performers; if you asked the same group to list the most important word-and-tunesmiths of the previous half century, the list would predominantly feature the kings and queens of Tin Pan Alley and the Brill Building. But today, the waters have muddied yet further. Since the revolution of the 60s, more and more artists followed The Beatles’ lead and began to not only write their own material but to actually build songs from scratch in the studio. In the 70s, this became de rigeur for innovative artists such as Stevie Wonder, Kraftwerk and Michael Jackson. Layering one improvised idea on top of another, songs began to take shape in the recording process, before being refined in the editing. With more and more players and technicians contributing to the creative process, it became harder to define who, in fact, had written the song. Was the horn player who came up with that catchy hook part of the songwriting process? Should he be credited as a songwriter? It’s a question addressed in the song ‘Studio Musician’, recorded by Barry Manilow. (Conversely, another Manilow recording on the subject, the hit single ‘I Write The Songs’, wasn’t written by the singer himself, as most people would assume, but was penned by Beach Boy Bruce Johnston.) On the 2016 Beyoncé album Lemonade, the songwriting credits include scores of names. In addition to the teams of writers working in and out of the studio, a song such as single ‘Hold Up’ also features samples and interpolations of older songs, bringing the songwriters credit for that song alone up to 15 people – including Brill Building pioneers Doc Pomus and Mort Shuman. But down the years, one thing has remained constant, and that is that great songs make for great records. You can have as much production and pizazz as you can afford, but you still need a song, or none of it matters. And when impresario Nigel Martin-Smith was introduced, in the late 80s, to a teenage singer-songwriter by the name of Gary Barlow, he knew that something great would come from the young man’s talent. He built Take That around Barlow’s songs, making them one of the most successful bands in UK chart history, thanks to original hits such as ‘A Million Love Songs’, ‘Pray’ and ‘Back For Good’ – songs that Barlow and co revisited for theit 2018 album, Odyssey.